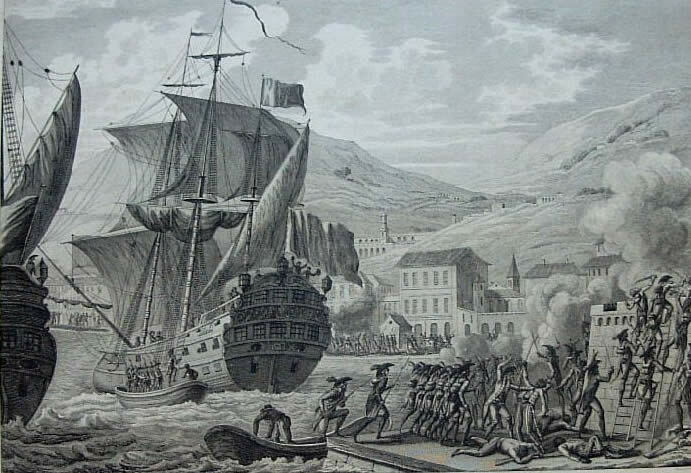 Here is a picture of Cap-Haïtien in the 1700. Cap-Haïtien was previously known as Cap�'Français or Cap�'Henri. In its earlier times, this present commune of about 190,000 people on the north coast of Haiti and the capital of the Department of Nord was also known as the 'Paris of the Caribbean" for its wealth of French colonial architecture, which has been well preserved. The city is situated on the coast of the Cap-Haïtien Bay, on the Atlantic Ocean, about 260 km north of the Haitian capital Port-au-Prince. The city was founded in 1670 on a Taino village called 'Gaurico'. Soon after the French took over the western half of the island from Spain, in 1711, the French made this city their colonial capital of Haiti (then Saint-Dominique) until 1770 when the capital was moved to Port-au-Prince.